North Staffordshire’s Rydale Roofing has won further success in the social housing market. The company has a longstanding business relationship with Aspire Housing, working on thousands of homes in Rydale’s home town of Newcastle-under-Lyme. Now further success has come with contracts for Shropshire Housing Association and with Novus for the Worcester Housing Group. Julie Mirowski, a Director at Rydale Roofing, said: “We have tendered for work with Shropshire Housing and have won a place on their contractors list. “We have been busy, reroofing homes in Market Drayton and Craven Arms. Our roofers have also been travelling to Worcester to support Novus Property Solutions with their work on Worcester Housing Group homes. “Social housing is not the easiest market to get into as the Pre-Procurement Questionnaire (PPQ) and tendering processes are, quite rightly, extensive. Rydale Roofing is the only roofing company in North Staffordshire to gain the 2016 National Federation of Roofing Contractors’ Safety in Roofing Gold award and one of just two in Staffordshire. “Our company has made a commitment to growing through quality and we ensure our workforce is trained to the highest industry standards,” added Julie. Rydale Roofing has also seen recent success in the private homes market, winning contracts for Lancashire based Sherwood Home, one of the UK’s largest builder of new houses. 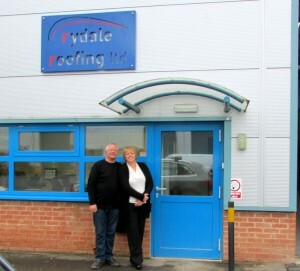 Founded in 1993 by Mick Mirowski, Rydale Roofing employs 19 people from its base at the Silverdale Enterprise Park.